*Update after post* This was part of my personal philosophy on volunteerism as it relates to philanthropy. I have blurred the lines between the true definitions of donating, volunteering, and fundraising simply because I have a hard time separating these concepts in my own head. My main goal was to share how important it is for ME to give back to my community. And how I strive to remain connected and aware of what is happening in my country and the world at large. This was not meant in any way to be a judgement on those that may not hold philantropy in the same light. National Volunteer Week is approaching. When someone mentions volunteerism, do you shudder and think, “Ok, what are they going to ask me to do now?” Or do you think, “Wow, that’s a great idea, how can I help?” Lets face it, we are all busy. You might think that your kind of busy is more important than mine, but thats a different topic for another day. I have been volunteering since the age of 13, at least that’s as far back as I remember. My first gig was as a volunteer leader for The B&G Club, which was my Church’s co-ed version of Boy Scouts or Girl Guides. I had graduated from the program, so was invited to continue on as mentor. Naturally, being very shy, it was a real challenge for me to try and talk to people. Having gone through the program myself, it was easy to use my own feelings and experiences as a way to encourage my younger friends. Volunteerism has become a natural concept to me and continues to be a big part of my life. There are groups that make constant pleas for donations and volunteers and this can seem like a pain in the rump. And yes, some organizations do go overboard, trying to evoke guilt to motivate people to give money. Those that don’t have money to give, tune out, saying “I can’t help.” I am in this category at times, I won’t deny it. I like to encourage people by reminding them that giving isn’t exclusive to monetary donations. You don’t have to make lengthy commitments or join a club either. Find an issue you are passionate about and determine a way to offer sincere aide. GIVE: TIME, TALENT, or TREASURE. It could be as simple as shoveling the driveway of a senior in your neighbourhood, or cleaning out your closet and giving gently used items to a women’s shelter. I’m going to get nerdy and throw a few stats at you *snort, snort*. immigrant populations and religious communities. There are many needs in every community that are met by the caring hands of volunteers. They don’t often get a lot of praise for what they do, but that isn’t what motivates us anyway. I have benefited from the nurture and guidance given to me by volunteer run programs, as a child, a college student, and now as an adult. I choose to give because I want to have a positive influence on the issues affecting neighbours in my neck of the woods. 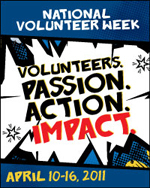 National Volunteer Week is coming soon, thank a Volunteer . Posted in Blah Blah Blogs, Mind's Eye View and tagged care, children, clothes, clubs, coaches, community centres, donations, food, food banks, friends, fundraisers, give, guide, guilt, humanitarian, immigrants, international, local, love, mentors, money, neighbours, nurture, plea, pledges, programs, reading, seniors, sincere, skills, social, social awareness, sports teams, talent, teachers, thanks, time, treasure, volunteer, women's shelters. Bookmark the permalink.